Tony Hyman has been collecting cigar boxes since he was 12. By his 17th birthday, he had amassed a collection of some 2,300 boxes. Recently, we spoke to Hyman about his online National Cigar Museum, which is a great resource for collectors looking to date U.S., Canadian, and Cuban cigar boxes. We also discussed the legendary self-igniting cigar and the history of cigar manufacturing in New York City. Hyman can be reached via his museum’s website, www.cigarhistory.info, which is a member of our Hall of Fame. The National Cigar Museum has been open for 10 to 12 years in various formats on the Internet, but I completely redesigned the site about four years ago. In the early days, I’d send information to industry executives, and they’d post it, so they had control of the site. But when iWeb came out for the Mac, it made it so easy to build and maintain a site that I took it back from them, because they weren’t posting enough new material. Since I’ve taken over the site and revamped it, I’ve put up 193 exhibits. Some of them have 100 or more photographs. My long-term goal is to have about 300 exhibits covering the history of cigars as well as the various artifacts associated with them—premiums, labels, boxes, photographs—and the complete gamut of memorabilia, including ashtrays and holders. I want to create a permanent source of information for everyone interested in the field. For the most part, the photographs in the museum are of my own collectibles. There are also a few exhibits from people who are very prominent in the field. For example, I went to Amsterdam and photographed several major collections of Dutch cigar tins. As a result, I’ve posted two exhibits—pre-World War I Dutch tins and post-World War I Dutch tins. Those are images from other collections. My goal isn’t to hog the glory, such as it is. Instead I want to provide information to museums, historical societies, amateur sellers, beginning collectors, and dealers, so they can properly evaluate what they have. I’m happy to refer to other collectors and their collections, and I show pictures of things that they own. Nonetheless, more than 90 percent of what’s posted belongs to me. I label the pieces and note in an item’s description if I don’t own it. Collectors Weekly: How long have you been collecting? 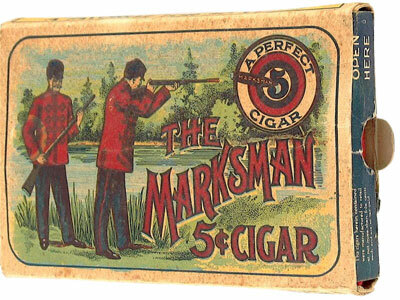 Marksman was a popular brand from the 1870s and beyond. This box is from the 1920s. Hyman: I’ve been doing this for 58 years. I started in 1952 at the age of 12. When I enlisted in the Navy at the age of 17, I already had 2,300 items in my collection. That’s what happens when you’re a child fanatic! I was trying to answer to the question, “How many different cigar boxes are there?” Over the years I’ve learned an awful lot. For example, one thing I’ve learned is that that wasn’t necessarily the best question to ask. But it was a fundamental question that has led me down many interesting paths allowing me to learn more about the industry. My goal is to understand the comprehensive history of my field. Collectors who do that make a major historical contribution. If you go to the history departments at Harvard or Yale, you’ll find these marvelous people who study the history of women, the history of politics—all this big stuff. But they don’t care much about the history of glass, the history of book matches, the history of yo-yos, the history of French dolls, or the sorts of things that fascinate collectors. I think collectors make an important contribution to social history because they are the preservers of that history. A lot less would be known about the history of dolls if it weren’t for doll collectors. The same is true of the history of toy trains and cigar boxes. Collectors Weekly: Did your interest start with cigar boxes and then evolve? Hyman: Yes. Everything evolved from the boxes, because I was trying to answer the question I mentioned earlier “How many different boxes are there?” I was an early reader and a library rat. We had a wonderful library where I lived as a teen, but I quickly learned that almost nothing had been written about cigars, cigar packaging, and their history. There was almost nothing known about an entire industry. When I started in 1952, there were only three books on cigars in English. One was from 1875. One was from around 1900. Another was from 1932, and it was a doctoral dissertation. That was it. You could find dozens of books on cigarettes, you could find dozens of books on dolls. You could find hundreds of books on toys. There was a lot of information in some fields, but there was almost none about the history of cigars. So my collection, out of necessity, spread to other categories—billheads, catalogues, correspondence, ledgers, photographs, trade cards, and those kinds of things. Only by learning about them could I piece together the history of the cigar industry as a whole. Collectors Weekly: How deep did you have to dig to find what you were looking for? 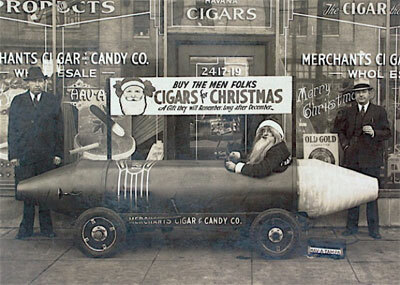 A giant Christmas cigar car by the Merchants Cigar and Candy Co. of Fort Lauderdale, Florida, in the late 1930s. Hyman: I’m still digging, and I’m going deeper every day. eBay has been a godsend. I used to go to all of the major advertising shows and to Brimfield, Black Angus, the Indie Show, and other extravaganzas in Florida and Pennsylvania. You could work hard at an event like Brimfield for five days and only come away with two or three items. Now I can do that in an evening by spending two hours on eBay. Even now, my picture of the industry is far from complete. After 58 years, I’m learning new things about the industry, such as how it solved problems and created new solutions and approaches to things. I’m still learning of new ways that manufacturers’ packed cigars. I’ve held more than 100,000 cigar boxes in my hands, and they can still surprise me. I continue to see some very interesting and unique pieces. That’s one of the things that I truly love about this hobby—there’s always something new to learn. If you’re the sort of person who likes regularity and order, you should collect coins, stamps, or Hot Wheels! I’m exactly the opposite sort of person: I like surprises every day. I thrive on the unexpected both in my personal life and in my collecting life. Collectors Weekly: What are the most unique pieces you’ve found? Hyman: Sometimes I play a little game with myself. I ask myself, “If I can only keep 10 items, which ones would they be?” Since I know that would be impossible, I then ask myself, “If I could only keep 50 items, what would they be?” Of course, that would be impossible, too. It would be very difficult for me to even pick 100 items because their variety is so extensive. If I had to pick a few, there’s a desktop cigar cutter that I paid a lot for—$2,500. It’s an absolutely marvelous piece. I show it to everybody who visits. I also have a wonderful deck of cards featuring pin-ups from the 1880s that would bring $1,000 to $1,500 at auction. These sorts of things are very difficult to classify. I own a document signed by a Spanish government official in 1818 licensing someone in the Canary Islands to come to Cuba and start a one-room cigar factory. That sort of item is hard to categorize, yet you can learn a lot from it. I remember the first time I went into an abandoned cigar factory. It had opened in the 1870s and closed in 1926, when its owners moved it from New York to Pennsylvania. The building’s new tenant had a store on the first floor and used the second floor for storage, but he almost never went to the third floor attic. I crawled up there and found hundreds of boxes of files and ledgers. They told me a great deal about how a cigar business was run in those days. This company only manufactured two cigar types, yet they were marketed under 100 brand names. That was a revolutionary concept. Learning about these custom brands happened early in my collecting experience, and it gave me an entirely new perspective on the industry. That attic was a treasure trove of information, and it was the kind of find I relish. Collectors Weekly: What sorts of categories do you like to collect? 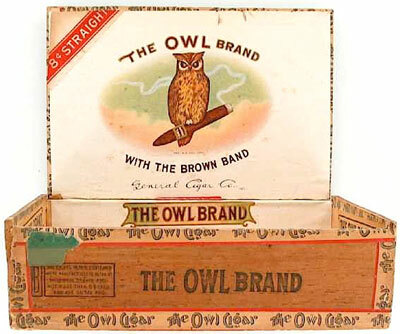 Straiton & Storm became General Cigar in 1917, but OWL remained one of the company's leading brands. Hyman: I like items with puns and jokes as part of the label or the brand name. I also like health claims that would be preposterous today. When I sold my collection of Canadian cigar boxes to the Museum of Civilization in Quebec, the curator gave me an 1884 Pennsylvania cigar box that told smokers they could cure their asthma by blowing the smoke from its cigars through their nostrils. Of course, today the idea that asthmatics should smoke cigars to cure asthma is incredible. That was a very wonderful thank-you gift. I recently came across an 1865 box emblazoned with a special black stamp depicting Abraham Lincoln. It was issued in his memory following his assassination, and was used only briefly in 1865. Inside was a picture of the USS Monitor, the first iron-clad ship. And it’s in color, which was rare in the 1860s. With a historic ship, a stamp commemorating Lincoln’s assassination, and color imagery, this was a very exciting find, the kind of thing I live for as a collector. Because I study the history of the companies and their processes and procedures, things such as this have great meaning to me because they are truly rare. I see that word ‘rare’ tossed around on eBay and in antiques shops all the time. Most of the time rare means junk that was made by the millions. After you’ve studied something for 58 years, you get a handle on what really is rare. That’s part of the fun of shopping after all these years. Collectors Weekly: What’s the earliest cigar collectible you own? Hyman: My earliest piece is a 1702 map of Cuba and its trade routes. At the time, Cuba provided most of the world’s cigar tobacco. So that map is significant. Regarding cigar boxes from the U.S. and Cuba, the earliest box I have dates from 1847, a date whose accuracy I’m sure of. In Cuba, cigar manufacturing went strong from about 1800 to about 1890 and changed radically in the 1890s during the Spanish-American war. In the United States, factories existed as early as 1770. But the industry really flourished in America after the Civil War, and I thrive on finding illustrations and boxes from the Civil War period. Collectors Weekly: What’s one of the strangest cigar collectibles you’ve seen? Hyman: The self-igniting cigar. Here’s the story: A big dealer whose specialty was cutters and lighters invited me to his home, saying he had many cigar boxes he wanted to sell. Most were pretty-picture boxes from the 1890s to 1920s. He wanted anywhere from $75 to $250 for each. The best he owned was the cheapest—a black-and-white item from 1901. He wanted $40 for it, so I bought it. It was something I’d never seen before—a box of self-lighting cigars! I knew I was looking at a historically significant attempt at doing something radically different, as well as a very short-lived item. To see another label depicting a scantily clad young woman or a Civil War battle is not nearly as exciting to me as finding this sort of landmark in the industry’s history. Collectors Weekly: How did the self-lighting cigar work? Hyman: Imagine inserting a wooden match inside of a cigar. In this case, however, chemical compounds were built into the cigar’s tip. It worked like a friction match. You’d strike it against an abrasive pad, and, boom, your cigar would ignite. Collectors Weekly: Why did it fail in the marketplace? Hyman: In those days match heads contained a lot of sulfur. It would have made these cigars stink, spoiling their distinctive aroma, something cigar smokers like. I’ve never seen an ad for the self-lighting cigar, and I read a lot of publications from that period. Cigarette makers also tried this gimmick for about 20 years with four or five self-lighting brands of cigarettes. None of them succeeded, either. Collectors Weekly: Can you tell us about some of the other forgotten failures? 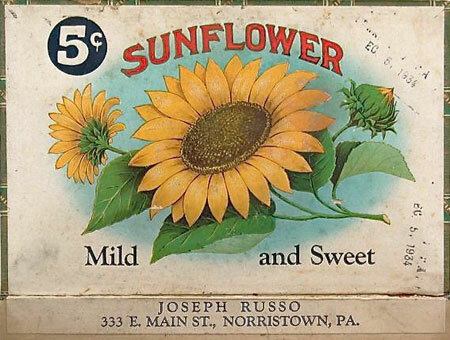 This box from the early 1930s was used by Norristown, Pennsylvania cigarmaker Joseph Russo. Hyman: There were attempts at different blends. One cigar claimed it was made from tobacco from the Holy Land. It smelled like lilacs. This wasn’t exactly the way to entice cigar smokers. Another novelty brand had a mirror built under its lid. When you opened the box, you saw two donkeys with a mirror between them. The name of the cigar? ‘Three Jackasses.’ This product was designed for people whose friends bummed a lot of cigars. Did it last? For a year or two. It was a gag. The cigar industry has been as faddish as Americans themselves. Today we’re enamored of celebrities and risque images. In the 1800s we doted on a slightly higher class of celebrities, possibly because Shakespearean stars were honored as much as vaudeville performers. Today that’s not the case. Pop singers and athletes get the accolades. Starting very early on, those people were on cigar boxes just as they’re on magazine covers today. 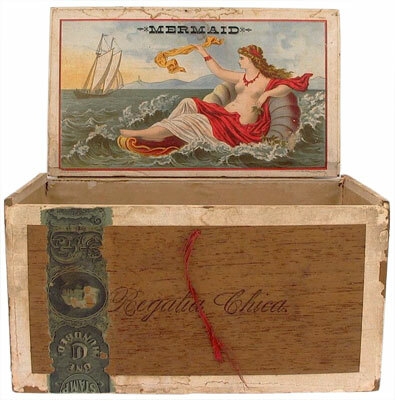 On the whole, however, cigar box imagery in the 1800s appealed to a slightly higher class of consumer. They depicted opera stars, serious authors, and famous painters, as well as slapstick comedians. Collectors Weekly: When did the cigar industry see its biggest growth? Hyman: After the Civil War. First, manufacturers developed an outstanding new cigar tobacco in Connecticut. Second, Sumatran tobacco arrived in the American market in 1876, and it was outstanding for cigars. Third, most of the taxes imposed to finance the Civil War were lowered and eventually abolished in 1883. Because the cost of cigars suddenly fell as their quality rose, the industry in the 1880s quadrupled and even quintupled. At the industry’s peak, 40,000 cigar factories operated in the United States. Between about 1840 and about 1940, roughly 250,000 cigar factories opened and closed. Each year we manufactured six to eight billion cigars, making us the cigar capital of the world. The state that produced the most cigars was New York followed by Pennsylvania and then Illinois. Surprisingly, for a while, California was in the top five. New Jersey and Ohio were two other very important manufacturing states, as was Connecticut. Florida ranked about 15th overall—during the height of its prominence in the 1950s, it rose to about third place. In the early days, the big producers were in New York, Pennsylvania, Illinois. At one time, there were 3,000 cigar factories in New York City alone. Collectors Weekly: How could so many factories coexist in New York City? Hyman: It’s a big place filled with lots of big buildings. Sometimes there were three factories in one building because most were tiny. Out of those 3,000, only about 70 had more than a hundred workers. The majority were family enterprises, little storefronts with perhaps three rollers, possibly employing only a man, his wife, and their children. They didn’t make the majority of cigars, but they comprised the majority of manufacturers. Such an establishment might have made only 20,000 or 25,000 cigars a year, but they were legitimate businesses. The big factories made a million cigars a day. Collectors Weekly: What manufacturers were the most prominent? A cigar box by giant New York City cigar maker Kerbs & Spiess, whose 750 rollers worked at 2nd Ave. at 54th. Hyman: If you want to know their names, go to my site, click on ‘Cigar History’, and you’ll be taken to a page on which I list about 50 major companies. For example, in the 1870s, the company Straiton & Storm owned three large factories in New York. It hired more than a thousand rollers and produced hundreds of nationally-known brands. There were about 70 such companies in the 1800s with maybe even a hundred factories of similar size in New York City. These places were very well known. Generally, however, it wasn’t the factory itself that was well known as much as its brands. People didn’t say “Give me a Straiton & Storm cigar.” They said “Give me a Robert Burns or an Owl” or some other brand. Factory identity didn’t exist for most American cigars, though it was very important to the Cubans. If you went to the supermarket today and said, “I like Tide detergent, but the color of its box clashes with my laundry room. Do you have the same detergent in a different colored box?” the clerk would think you were crazy. But in 1900, you could order your own custom brand of cigars that way, selling the same cigar in different boxes, and everybody did that. That’s why there are so many cigar brands. Some factories’ ads said, “For the trade only.” Consumers couldn’t buy from them. They manufactured brands for distributors, wholesalers, and retailers who would order 500 boxes of this or 200 boxes of that, creating scores of custom brands. A medium-sized factory employing 30 or 40 people might make a hundred brands. Wholesalers would say “I want 20 brands, and I want a different zeppelin on each label.” Bingo: you’d have 20 new brands and 20 new packages. Then, when the wholesaler saw that they weren’t selling, he would say, “Well, give me 100 boxes of the same cigar, but this time put a bunny rabbit on them.” Now the rabbit brand doesn’t sell, so he says “I’ll buy another 100 boxes of those same cigars, except this time put a naked lady on the boxes.” Suddenly, these cigars are selling like crazy. That’s how the business worked. In Cuba, it was an entirely different story. A company would make many private brands, but it was very proud of its corporate identity. Partagas and companies like that kept their boxes, logos, and designs the same for a century. In the U.S., nobody did that. Nobody. Here labels changed every few years, because there was no such thing as tradition in the United States. We were and are fad-driven. Everything has to be new, the latest, the most up-to-date. The cigar industry was no different from any other. It was constantly fiddling with its brands and logos to tell consumers an ever-changing story. That’s what makes it fun to collect cigar boxes. There are probably close to 2,000,000 brands of cigars. Collectors Weekly: In the United States? Hyman: Yes, if one cigar could be packaged under 100 different brand names, and there were 40,000 factories, the numbers get staggeringly big. I’ve got cigars whose boxes feature pictures of rattlesnakes, black sheep, skunks, and salamanders. I don’t believe a box picturing a slimy little amphibian is going to sell many cigars. How long was that salamander-brand or skunk-brand cigar around? That question is generally impossible to answer. Consider that out of the 4,000-or-so boxes that I own, more than half are the only one of its type known. That says much about how short many brands’ production runs were. Collectors Weekly: Were the production runs based on whom the companies were marketing their cigars to? A 1911 Campbell-Lakin Segar Co. advance card. 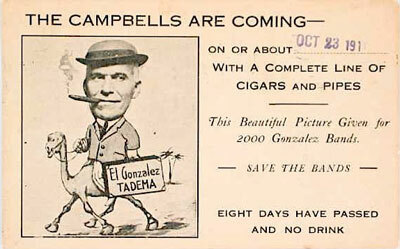 Campell-Lakin Segar Co. was a Portland, Oregon wholesaler, whose brands included Tadema, El Gonzales, Havana Taste, San Lucia, Prime Minister, Refund, and Passport. Hyman: Yes. For example, brands might have been marketed to a particular ethnic group, although that wasn’t so common. Some cigar boxes feature text written in Polish. I have two or three such items. These were made in Chicago where there was a huge Polish-American population. I have one box directly aimed at German-Americans. Today if a company’s going to launch a new product, it knows the science of surveying consumer preferences, and it’s studied the great advertising campaigns of the last 150 years. Well, in 1850 there was no background. Everything was new. Companies had to discover something as basic as the fact that an image of a naked woman on a box will outsell a box with a picture of a moose on it. I actually have a cigar box with a dead moose on it. The cigar industry created the roots of all of modern advertising. It was the first to do promotions. The first premiums that we know of were done by a Cuban cigarette company. Cigars jumped on that bandwagon very quickly, using giveaways, putting things in packages, and offering discounts, things that we take for granted. What are the great advertising themes of today? Family, health, good times. There’s a very fundamental attraction to advertisements with pretty girls or puppies. These are the things you see in advertising over and over and over—wealth and health. Sit down and thumb through just about any magazine and look at the ads: they all boil down to a very few themes. Regional marketing was also very important. Collectors Weekly: Can you give us an example of that? So here’s the same nickel or 10-cent cigar, and everybody is ordering a custom label. A custom label would cost the retailer a penny extra for each box, two cents at the most. If you could have your own custom box of soap or tissues or whatever it is that you use for publicly, and could have your name and face on it, wouldn’t you pay an extra penny? Of course you would, and retailers in those days did, too. Collectors Weekly: People got more excited about the boxes and the labels than about the quality of the cigars themselves? Hyman: Of course. If you went to a tobacconist in 1900 in a town, say, the size of Green Bay, Wisconsin, or Dayton, Ohio—a nice small- to middle-sized town—the tobacconist would have maybe four cigar counters each containing about 30 boxes. He’d be marketing 100 brands in price ranges from 2 cents each to 50 cents or a dollar per cigar. There’d be all these choices, and the storekeeper wanted to catch your eye. The more eye-catching the box and its label, the more likely a shopper would be to buy a more expensive cigar. 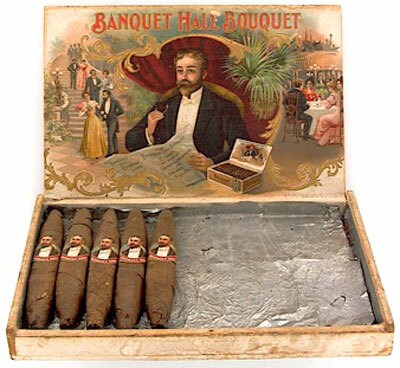 Ultimately, the goal with a fancy box is to sell you, the consumer, a whole box of those cigars, and that was very common in the 1930s. You can read all about that on my site. Collectors Weekly: Is there a difference between a cigar lighter and a cigarette lighter? Cigars by M. Foster & Co. of New York. Hyman: Yes. Cigar smokers are very conscious of tobacco’s aroma because cigar smoke is held in one’s mouth longer than that of a cigarette whose smoke is inhaled into the lungs. Therefore, cigar smokers prefer an odorless flame like butane that doesn’t affect the odor of the cigar. Cigarette smokers don’t care what they light their cigarettes with. Cigarette and cigar lighters attract two separate groups of collectors. It’s not because the product is necessarily that different. It’s that they are very different collectors. At one time an article in Antique Trader listed 91 different categories of collectibles related to tobacco. It’s surprising that people think of tobacco as some kind of monolithic world. People who want cigarette lighters want cigarette lighters. None of us will pass up a great bargain or any interesting piece that’s reasonably priced in some other category, but the bottom line is that you can have the most wonderful cigarette lighter in the world, I’ll pass it up because cigarettes aren’t interesting to me. Now, of course, if you’re selling something from the world of cigarettes from the 1880s, and it’s not overpriced, I’ll buy it because that was the early days of the battle between cigars and cigarettes. It’s a historically interesting piece to me. Collectors Weekly: To what degree are you in touch with other collectors? Hyman: I wrote for The Trader for about 25 years. I used to get a lot of reader questions. I still do. Right now, I have about 280 unanswered questions on my website. They pour in, and I’m able to answer about 90 to 95 percent of them. It ultimately becomes a matter of finding the time to do it between living my life and writing several pieces for every issue of Cigar magazine. I’m 70 years old and have a house and garden to maintain. So I’m not building my website as fast as I’d like to. As a result, I don’t keep up with all the questions I know that I should answer. I do get to them eventually. Those with good, sharp pictures always rise to the top of the pile. Collectors Weekly: What are some of the other things that cigar-industry collectors like yourself collect? Hyman: There are people who collect labels and people who collect boxes. Box people have a few labels, and some label people have a few boxes, but basically a person collects one or the other. 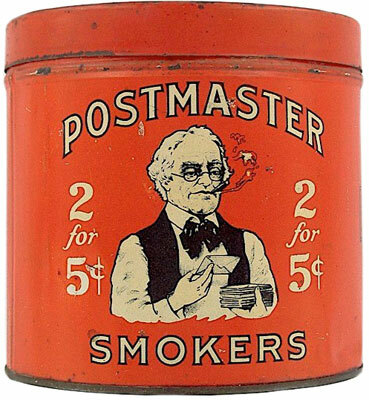 There are people who collect lighters, vending machines that gave away cigars, cigar advertising, trade cards, salesmen’s advance cards (the postcards salesmen sent to retailers that told them when they would arrive), tin signs for cigars, pouches, holders, cigar union items, cigar bands. You name it. If it has to do with cigars, people collect it. I inherited a wonderful 24 by 24 inch cigar band collage that is on tempered glass. I have no idea of its value or how I might possibly sell it. Everyone who sees it says it is really unique but has no idea of its value or where to look to find its value. Could you “steer” me to someone who might be of assistance. I just found a cigar box-well several but most are the normal cardboard type. This one is made of tin on the sides and top, it has a lock. The bottom is wood. On the top is a painting of a what seems to be a middle eastern scene. The painting may or may not be on the box but it is in a frame and protected with a clear plastic overlay. The only damage seems to be to the top of the painting (or it may be part of the painting). The seal is still on the side. It is locked and I have not yet tried to find a key to open it. It has been stored away for at least 70 years as I don’t remember ever having seen it growing up. I am NOT interested in selling or really the value-just want to find how how old and something about it. I appreciate your web-site; for it seemed to be the only place I could glean any information about a cigar factory in the early 1870s in New York, at all. However, you didn’t mention the name of that factory, or I missed it. I am searching for the name of that factory, or any other in New York, which may have employed my great grandmother in the 1870s. Also, are there any records of employees from the cigar factory(s)in New York at the dates mentioned above? I would love to have this information, or a source I can find it. I recovered 3 old cigar tins from a garage. No idea of value or what to do with them. I am not a collector and would like to see someone that is to not see them end up in the trash. One of them has the paper with the advertisement on it. Any ideas? I have about 7 cigar boxes that I believe are not very rare or valuable, but would like to donate to someone who might be able to use them as a started collection. Being a collector myself of various things, I always appreciated when someone gave me a starter item. I learned and moved on. If interested in these boxes, please send me an address and I’ll ship them out. NO cost to anyone. There are 3 Dutch Masters – Pantella, 1 Marsh Wheeling Deluxe – Dark, 1 Antonio & Cleoplatra (with a Cuban Import/US customs sticker, King Edward The 7th (Imperial) and an RGDun – Admiral. Good luck and best wishes for a happy holiday season. With a picture or a lot more info I’m afraid I still couldn’t tell you much. Cutters were always both out oof my price range and interest focus. If it’s a mechanical counter-top cutter in good working condition experience over the past decade says it will bring from $200 to $700 on ebay depending on its form and attractiveness. I like this post! i really appreciate your article, for it seemed to be the only place I could glean any information about a cigar factory , thank a lot for sharing this post! cheers! For Phil: I’d be more than happy to tell you about your box. To do so I need three pictures  inside lid  bottom  outside view showing top, front and most interesting end. It would be helpful to see a close up of the Tax Class Notice (a one inch rectangle which begins: the cigars herein contained…). Your description makes it sound like a home-decorated piece of kitsch (some call it ‘folk art.’). Thank you for a great article and website. I do have a Tin Box 11 cm by 7cm by 5 cm. It is orange and brown and has photos of the Netherlands Royal Family on the top (Queen Wilhelmina center Juliana and Moeder on left Willem III and Hendrik on the right). How do I find information on this tin? I don’t see it on the National Cigar Museum Website and various searches have turned up nothing. Thanks, Steve G.
I can’t seem to find out any information on several cigar boxes I found when cleaning my Mother’s house. 1. Panama Coronas Mild is stamped on the top, Boite Nature is stamped on the side and on the bottom (there is no date) it is stamped with: Fact. No. 360 1st Dist. of Pa. Can you tell me anything about this and what the value might be now? Thank you! There is very little information on this. I also have several that are stamped with: Garcia De Luxe (on the top) and Londres stamped on the front. The bottom is stamped : Factory No. 1514 1st Dis. Pa.
2 Regalia Cigar St Lesley (Leskey?) & Co.
A note writen by my great-great-grandmother with the cigar is dated 1908 and says her husband brought it from California before they were married (1858). Question: What is the appropriate thing to do with this cigar? Do I donate it somewhere, sell it, or is there another Web site I should look at? I have a 1883 little Bully wooden cigar box with the Pacific Coast International Union No. 228 SF White Labor Label. Can you give me information on its rarity and possible value. My Mom is clearing out her garage and found 4 salesman cigar label books. I looked a few up with the intention of selling, but I don’t know if these values are current and the best way to sell the labels. Any advice would be greatly appreciated. Nice garage find. A few catalogs can be valuable, worth $1000 or more. Before I can advise you, I need more info. Label catalogs come in many sizes & configurations and from a dozen or so printers. Are yours paper or hard-cover? 12 or fewer pages or hundreds of pages? If paper 12 or fewer pagers, how many labels don’t have large central images? What are the images on the labels that have them? As a keen cigar enthusiast, I spent two glorious hours browsing this great site. It was fine to meet a person who is keen to share his collection and an outstanding one it is. I’ll be back ~ to quote Arnie. Thanks for your nice comments. There are 230 individual separate sites on my Museum site, but I’m only half done. I hope to get back and add a lot more. I hope you found about the tax wars, the life of a salesman, 20th century Cuba and some of my many other “favorite” chapters. I really enjoy working on the Museum site and truly enjoy when someone discovers and enjoys what’s there. Thanks for writing. Been hanging on (30 years) to a hinged cardboard wood grain cigar box (5 1/4 x 8 1/4 x 1 1/4) I found in the rafters of an old house I once owned. What’s left of a Canadian stamp/sticker is still on it dated 1960 for 25 cigars. The brand name on the box is HUB CIGARS. I tried to find something on this in your museum but no luck. All I could find searching internet was that there once was a shop that went by the name HUB in Edmonton, Alberta Canada. Have you ever heard of this brand? I’m more curious than anything. I have a cigar box made of wood and metal with a picture on the cover of two ladies in waiting. Inside is a mirror and the box is wood. I always thought it was a jewelry box because my mother kept it in her drawer with pictures. She said she got it as a birthday present but when I looked at the bottom of the box it said it was a cigar box. I would like to know more about it. If not… I’ll need pix of the overall box AND the bottom and we’ll start over. looking for a marsh wheeling cigar band for an older friend who was raised by a man who smoked marsh wheeling stogie cigars (this was in the 1950.s). I am trying to purchase this item but have not been able to find it. I have a vintage cigarette lighter the bottom case of which is stamped “Victory” in a flair type. It is semi-automatic and is silver plated brass. I have hours researching it and found nothing for the Victory lighter/brand, but have found the exact copy of the lighter, the c.1937-8 German Mylflam Perfekt 9 lighter. I’m thinking that the Mylflam company (which on the bottom of its Perfect 9 lighter the Mylflam is stamped Mylflam in a flair type) produced the Victory lighter for the American market and that after their initial introduction Germany went to war and that ended the production of this lighter. My question is am I right? And do you have any information on the Victory lighter? so don’t kno who’s who any more… after 20 years of writing about them… so can’t recommend. Sorry. I am selling some items for a man whose father worked in SLC Utah and he has a press and a piece of equipment for applying labels with. Where would I get some info on the values and maybe the best venue for selling them. I’d love to see a photo of this piece of equipment, as all the photo I have show women putting labels on by hand. I always like to learn new things, one of the reasons this hobby has been so interesting. Can you give me approximate date your dad worked there and this machine might have been used? Is there any value to a large solid wooden cigar box that appears to be the personal cigar box of Major General Josephus Q Ramas, The company name inside is Tabacalera, it also has a working humidor inside the lid with a pull out drawer under the main body of the box. The reason I know it belonged to Major General Josephus Q Ramas is that his name is engraved on a metal plate on the top of the wooden box. I believe he was a close friend and confidant to the President of the Philippines. I just noticed there is a show and tell section I will try and post a photo of the outside and inside of box within the next few days.